You never know what wacky words will come out of a child’s mouth. I know from personal experience, there’s absolutely no way to predict, mute, or censor whatever random thought is rattling around in that little brain and it’s seemingly always ready to come flying out at the utmost inappropriate times (because that’s how they roll). I know my kids have said some things in front of others that left me in total embarrassment — but luckily, it’s typically a phase. In the case of Ashton Kutcher and Mila Kunis’s 2-year-old daughter, Wyatt, who is apparently quite the talker, you might even hear a curse word or two! 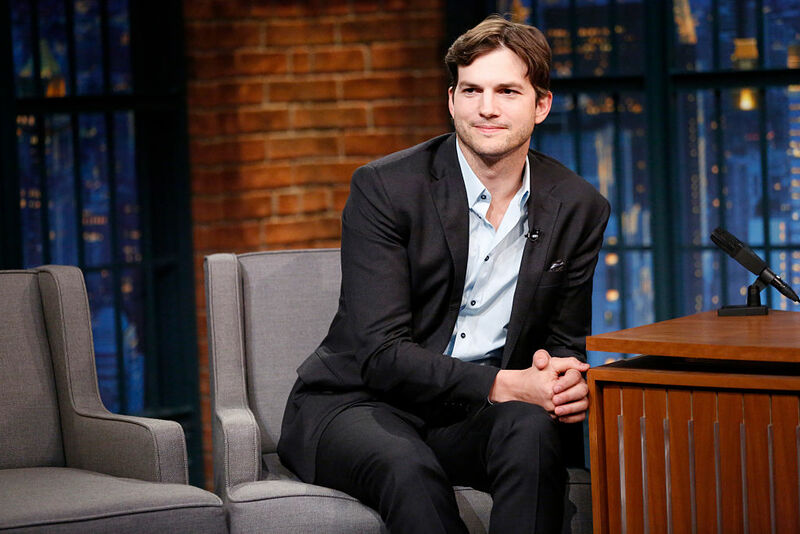 Kutcher elaborated in a recent sit-down on NBC’s Late Night with Seth Myers how this came to be in the video below. "I'm getting ready in the morning and Mila's like, 'Oh, Ricky peed in the stairwell.' I'm like, 'F--k, Ricky!'" Ashton said to host, Seth Meyers. He continued, telling of Wyatt’s pretty hilarious follow-up to his explicit reaction. "I'm walking and my daughter's right behind me, and all of a sudden I just hear, 'F--k, Ricky!' I'm like, 'No, no, no! Papa didn't say that. Papa said fox! Papa said fox! Ricky's like a wily fox.'" While a great cover-up, little Wyatt wasn’t falling for it. Kutcher went on to add how she repeated “F–k, Ricky!” when their family dog chewed up their carpet and who wouldn’t?! "I think I've got her convinced that it's 'fox' now," Ashton said. "I'm pretty sure she thinks its 'fox.'" On top of all this cursing, Wyatt is a pretty smart gal. She’s apparently already on the path to learning and understanding not only English, but Spanish and Russian as well. It makes sense since Russian is in Mila’s blood, her family having emigrated from Russia to the states when she was small. We can’t help but wonder if Wyatt has picked up on any curse words from other languages! "Mila's grandparents basically only speak Russian, so I took like six months of Russian to understand what they were saying. Russian is a very aggressive language. It doesn't matter what you say, it sounds like you're yelling...Everything sounds really aggressive. I thought that they really didn't like me. I thought that they were really upset," he said. Kudos to you, Ashton, for learning the native language of your beloved! With Kunis due to have their son in a couple months, we’re sure the smarts won’t stop at Wyatt. As far as how many children the two will have, it’s hard to say.
. . . She might cut me off. I want like 12 of them. I don't know. We haven't discussed it yet. Regardless of how many baby Kutchers they have, hopefully Ashton will be more careful about what he says to the dog next time!